Once again, cyclists were challenged to attempt “Karen’s Killer Ride”. This is a circuit ride to Steiglitz and Anakie with some rather daunting hills. Five riders attempted (and completed) the challenge – Karen (ride leader), Kelly, Dave S, Dirk and Helen. Conditions were windy – a gale from the north west made the journey to Maude on Steiglitz Road difficult. The hills were, if anything, a relief from the wind. However, with an existing back injury, Kelly, who is usually in the ‘king of the mountains’ category, was in increasing pain. Bunjil Lookout at Maude was a suitable stopping point, with its stunning view from high above the Moorabool valley, with ‘Godzilla’ one of the districts worst climbs, snaking across the river and up, up, up to the west. Luckily today’s ride did not include this road, but Dave was seen licking his lips with the challenge. It was windy so the stop was brief. From here the road winds its way up for a kilometre before a steep descent to Sutherlands Creek. Here three other cyclists were stopped, one of them injured. However, the ambulance was right behind us and the injured cyclist, who was in pain but talking, could be properly looked after. Our five cyclists started up the 5km ascent to Steiglitz, at the top of the Brisbane Ranges. Kelly was forced to walk some of this, as he was at risk of damaging tendons. Eventually, the De Motts Road turn-off was attained. By this time, the ride had entered forest, which meant the wind was no longer a problem. A road sign warned of a 15% gradient (and that was just going down). It’s a long ascent to Sutherlands Creek, before the road rises very steeply. The climb back to the top of the range is around 2.5km, with the steepest section in the first 5oo metres. Legs were stretched and pedals pushed hard. Kelly once more had to take rest breaks, but finally the whole group reassembled on the top. The long downhill to Ballan Road allowed legs to recover and gave brakes a work out. Never had a coffee break been better earned! Anakie Store is warm, comfortable and the owners friendly. It was payback time on the return trip along Ballan Road. The gale was in ‘cyclist-assist’ mode so speeds ranged from 30-40kph. Luckily there was little traffic, as there are many potholes and rough sections and the road has no sealed shoulders. The final swoop down the hill and over the Ring Road was accomplished in style as the riders disbanded. Storm clouds were gathering over Geelong. Thanks to Karen for once again setting this challenge. 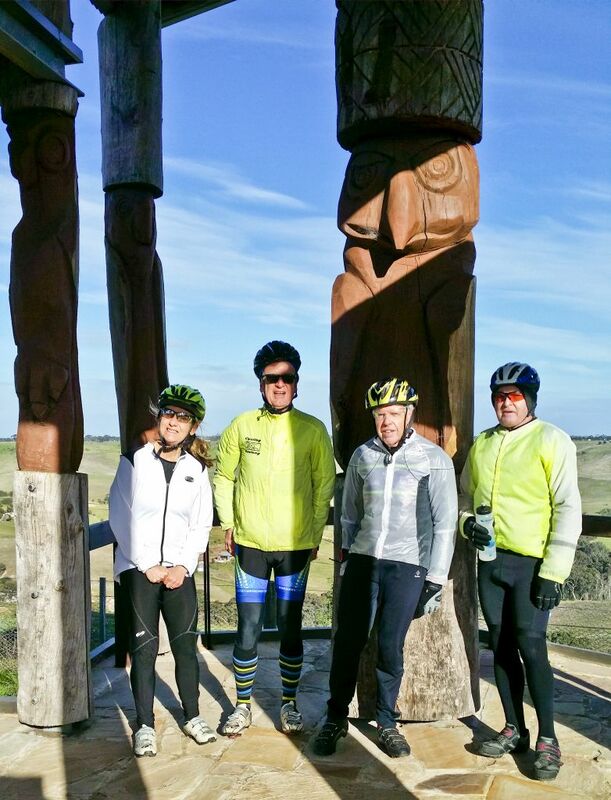 This entry was posted in Ride reports and tagged Anakie General Store, Bunjil's Lookout by hlyth2013. Bookmark the permalink. Thank you for the great post Helen and thank you to everyone who attended.